In 1872 Pleasant Henderson Hanes organized P. H. Hanes Tobacco Company in partnership with a younger brother, John Wesley, and a Davie County friend, Maj. Thomas Jethro Brown. When the business burned in 1874, Brown left the organization and was replaced briefly by another of Pleasant's brothers, Benjamin Franklin. Pleasant traveled to promote the tobacco market while John Wesley remained at the plant to attend to the manufacturing process. After the brothers sold the tobacco business to R. J. Reynolds in 1900, they entered the textile business. In 1901 John Wesley Hanes opened the Shamrock Hosiery Mills to make infants' and men's socks. In 1902 Pleasant Henderson Hanes joined with his sons (Pleasant Huber and William Marvin) to set up the P. H. Hanes Knitting Company to make men's and boy's underwear. Shamrock was renamed Hanes Hosiery Mills in 1910 and soon became recognized as the world's largest producer of women's seamless nylon hosiery. In 1920 Hanes Hosiery began focusing on women's apparel. Hanes Dye & Finishing Company was opened in 1925 to bleach, dye, and finish cotton piece goods. During World War II, Hanes received many War Department contracts. In 1965 the Hanes Corporation was formed out of the two Hanes companies, with Pleasant Huber Henderson Hanes Jr., as president. On 30 Jan. 1979 the corporation became part of Consolidated Foods Corporation of Chicago. (Consolidated Foods changed its name to Sara Lee Corporation in 1985.) Hanes, with its highly successful men's underwear, L'eggs brand women's hosiery, and Hanes Her Way women's underwear brands, manufactures a significant portion of Sara Lee's diversified consumer product lines, which also include Sara Lee bakery goods, Aqua Velva, Playtex Wonderbra, Ball Park frankfurters, Hillshire Farms and Jimmy Dean sausages, and Kiwi shoe polish. Sara Lee is headquartered in Winston-Salem, and there are Hanes-Sara Lee facilities in Butner, Valdese, Yadkinville, Asheboro, Rockingham, Tarboro, High Point, Kernersville, and Mount Airy. The Hanes name continues in a number of Sara Lee subsidiaries, such as Hanes France, Hanes Italia, Hanes Puerto Rico, and Hanes U.K. Ltd. In 1997 Hanes brands generated more than $2 billion in sales for the first time, and Hanes remained in the early 2000s the world's largest apparel brand. P. H. Hanes Knitting Company, The Hanes Story (1960). Jo White Linn, People Named Hanes (1980). Frank V. Tursi, Winston-Salem: A History (1994). 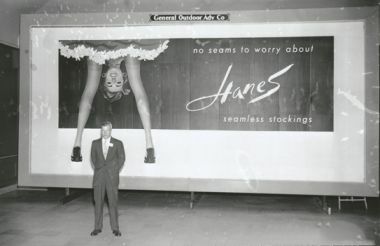 "Gordon Hanes, of Hanes Corporation, in front of a Hanes Hosiery billboard, 1956." Image courtesy of DigitalForsyth. Available from http://www.digitalforsyth.org/photos/11188 (accessed June 28, 2012).